This post goes back in time a little bit to 2011, to a trip I took to Holland and Belgium. While in Brussels, we stopped at the Royal Greenhouses of Laeken, an immense network of greenhouses covering approximately 270,000 square feet at the Royal Palace of Laeken. It was designed, in the art nouveau style out of glass and iron, by architect Alphonse Balat with the help of his student Victor Horta. Victor Horta was also one of the most important names in art nouveau architecture. Construction of the entire complex took thirty years. The greenhouses feature around thirty pavilions, glass cupolas, and arcades that cross the site like covered streets. 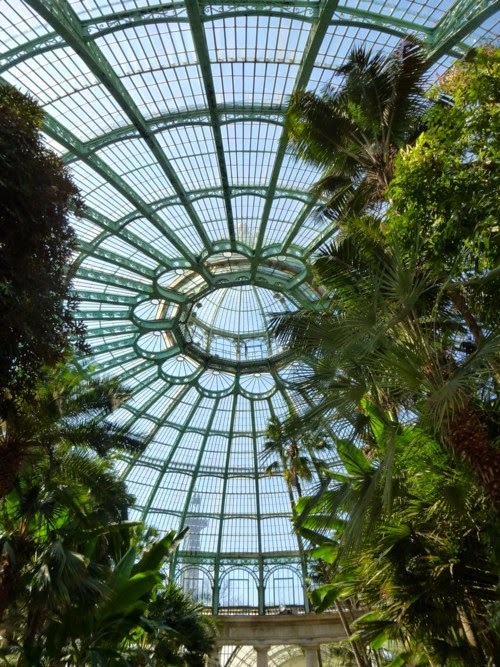 The largest dome - The Winter Garden (Grand Jardin d'hiver or Grote Wintertuin) was built between 1874 and 1876. The dome was large enough to accommodate large palms, many of which date back to Leoplod II. Royal receptions were also held in the dome. There is a wide variety of plants inside, including huge palms, azaleas, geraniums, camellias, fuchsias and medinillas. These greenhouses are only open for the public a few weeks out of the year (late April/early May), so be sure to check the dates. Admission is a bargain at 2.50 Euros and free for kids. A planted corridor. The "Serre de Diane"
That IS a big fern! As soon as I saw the photo, that's what I said, before I saw your caption. What a beautiful place to visit while on vacation. Oh my gosh, that FERN. I wish, I wish! And I am swooning over those tall dangling fuchsias. If only I had the money to install an orangerie. I could die a happy man just having one tiny room of that greenhouse. Glad I don't have the heat bill though! I myself went to Holland recently. I went to Amsterdam with the girls. We had a few days in the City enjoying the party atmosphere but then a few days taking part in more relaxed endeavours. We were going to visit Belgium and having seen your pictures I'm gutted we didn't the gardens look amazing over there. I must get over there soon.